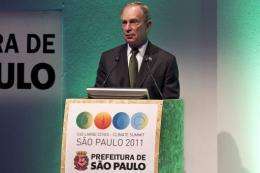 New York City Mayor Michael Bloomberg, chair of the C40 Summit, delivers a speech during the opening ceremony of the C40 Large Cities Climate Summit being held in Sao Paulo. Leaders of the C40 Mayors Summit on climate change said Wednesday the group had reached a financing agreement with the World Bank to help the world's major cities better adapt to climate change. Leaders of the C40 Mayors Summit on climate change said Wednesday the group had reached a financing agreement with the World Bank to help the world's major cities better adapt to climate change. "The partnership with the World Bank creates opportunities for financial support," said New York city Mayor Michael Bloomberg. "If we don't stop polluting our world right now, and continuing to spill greenhouse gases into the atmosphere, the consequences may be very well irreversible," Bloomberg said. The 40 major cities whose mayors are attending the Sao Paulo conference -- including New York, Jakarta, Mexico City, Berlin, Barcelona, Rio de Janeiro and Paris -- are responsible for 12 percent of global greenhouse emissions. "Cities are also paying big price of climate change," said World Bank president Robert Zoellick. Zoellick told the mayors that he would make it easier for cities to use the Bank, as part of an effort to make available as much as $6.4 billion the Bank has earmarked for climate relief programs. Private initiatives, said Zoellick, could lift that amount to as much as $50 billion. "The memo of understanding between the World Bank and C40 is a window of access for cities," added Zoellick, and should help them gain "more access to develop strategies, mitigation, technical assistant". Former US President Bill Clinton, whose foundation works with the C40 group, also praised the agreement. But he said one of the biggest problems with going green was financing. This is the fourth C40 summit, but the first one held in the southern hemisphere. On Thursday, the mayors meet with local authorities to discuss urban planning, public transport, capturing contaminated gas, and green industry. Is this what our politicians have been doing? Mayors of our cities now negotiate directly with the World Bank? Has manipulation of government science been used to establish a one world government? What happened to the city, state and federal layers of government that were there to protect local institutions from one-world government? Bill Clinton, whose foundation works with the C40 group, also praised the agreement. Intriguing! A great puzzle here ! 1. Bill Clinton's friend Al Gore led the AGW scare. 2. Al Gore and the UN convinced world leaders to join. 3. Government research funds financed the AGW scare. 4. Bill Clinton's foundation works with the group of mayors. 5. Bill Clinton's wife, Hilary, is Secretary of State under Obama. 6. Western nations with economic problems borrow from the World Bank. 7. Does some behind-the-scenes money scheme generate the World Bank's funds? 8. What happens if New York, Jakarta, Mexico City, Berlin, Barcelona, Rio de Janeiro and Paris default on their loans from the World Bank? Are (1-8) clues to the actual purpose of the AGW scare promoted by Al Gore and the UN? I cannot fit all these pieces together, but this is an intriguing story! Intriguing! A great puzzle here! not too suprising really considering your strange beliefs that the sun is some big ball of unstable iron. Also does anyone here really believe you worked for NASA? Beyond some janitorial role of course? Lay off Oliver, would ya? His comments are consistently more intelligent than any of yours. Bloomberg is a globalist zombie-chief and he gives me the creeps. Any time a local government official starts howling for climate controls and starts making independent gestures towards a foreign NGO like the World Bank you have to realize their loyalties and priorities lie far, far away from the people of the United States. "Agenda 21, the Rio Declaration on Environment and Development, and the Statement of principles for the Sustainable Management of Forests were adopted by more than 178 Governments at the United Nations Conference on Environment and Development (UNCED) held in Rio de Janerio, Brazil, 3 to 14 June 1992." Where does the World Bank get money to loan to formerly sovereign nations, cities, etc. as Western economies collapse ? Watergate taught us to follow the money. So where does the World Bank get money? "Nixon in China" - The story of the historic 1972 visit of Nixon and Kissinger with China's Chairman Mao. Early on the opera mentions "an ocean of distrust" that divides East and West in these "unsettled times." The opera challenges "organized oblivion", gains and losses since 1949 (Start of the Korean Conflict? ), the practice of "sending our children on crusades", an an intriguing mention of the Liberty Tree by Mao. May date back another 20 years to the events of 1972. I recommend the opera to anyone seeking answers. I can imagine the World Bank sees itself a sovereign entity, able through its organs to obtain printed fiat money and obligate unwary nations with debt. No doubt these payments must be tendered in real goods plus usury. I suspect the corrupt rulers who gain from these loans use the lands of their people as surety, perhaps even redirecting taxes to this banking cabal. To this day Bernake refuses to allow the structure of these banking organs of the world state to be fully mapped and revealed. Even to a simple mind as mine, this concealment is threatening and arouses alarm. Ben Bernake conceals the dimensions of this cabal just as a great general hides his advancing forces to forstall alarm until they breach the city's defenses. Will the budget battle in Washington, DC tip Bernake's hand? Did the Korean War scare world leaders about the possibility of mutual destruction by nuclear warfare? I don't know. But the roots of the economic/climate crisis may go as far back as 1950, 1972 or 1992. I note that it was the Republican deregulation of the banking industry that has been shown to be the cause of the current, deep, American recession. Republicans and Democrats both seem to have been involved in manipulating government science into the propaganda tool that eventually destroyed Western economies. As noted above, Maurice Strong became head of the United Nations Environment Programme (UNEP) in December of 1972. UNEP was established in June 1972. Your physorg manners need some banging on, Vendicar. If you want to just bark at certain ideologies and bite the bumpers of passing conversations why not hang out with your own peer group? I recommend www.abovetopsecret.com? There's plenty of troll fodder there for you to roll in. Oliver, simply realizing that we don't have a ready answer for your question is enough to justify the inquiry. The World Bank exists to insure the resources of the poor are secured for the will of the rich. The question of where they get the "money" to loan to these poor nations is a good one and the ability to answer this question plainly is essential to build a correct understanding of the powers in operation. What sane person wants to distract us from this understanding, or help conceal them from us? Surely such a person is not good, nor can their intentions be healthy for us. Bloomberg's appeal to this nationless cabal is more worrisome than any sort of environmental fairy tale. Population control is the driving force behind all carbon schemes, and nothing could please a dragon like Bloomberg more than total control over human industry, transactions, and movements.